...you wanted it! Because you demanded it! Because you cannot live without it! The music blog o' Rob is now born. I Tweet and Facebook and generally whip all my friends to death with both written and verbal opinions about music on a neverending basis. So I might as well try to consolidate a good portion of that into a blog because there's no doubt that you need MORE social media and more ME. My mission is clear. I will say things about music and stuff. You'll reply with stuff about music and stuff. So yeah, no need to make it more complex than that. As we approach the end of both the year and the decade, a ton of "best of" lists will be beating you into submission. But since I know that for many of you I am your most trusted source for "good music discovery", you need look no further than this very spot. In the immortal words of the greatness of Morrissey, "All you need is me." So just know that I'll be working hard on my own lists for your viewing and listening pleasure. In the meantime, I've re-posted my year end "best of music" articles from 2007 and 2008 that were originally on my personal blog to tide you over. Please feel free to give feedback. "Hate mail"-style responses are ESPECIALLY ENCOURAGED. The hate makes me stronger. Unlike my personal blog, I don't really care to make an effort to hide the MJRMB (see what I did there? ), so I'll keep you updated on new posts via Twitter and Facebook. Now go on and finish your work day and then schedule some time of thanksgiving to celebrate what may in fact be the first day of the rest of your music life. P.S. 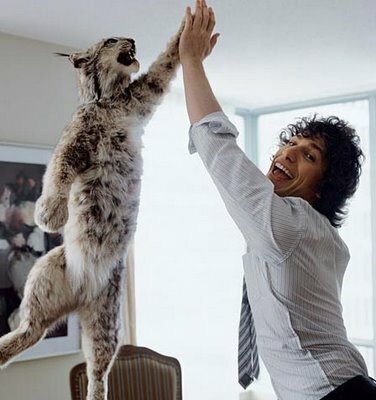 You're probably wondering why I have a picture of Andy Samberg high-fiving a bobcat and what that has to do with my blog or music. And my answer to you is don't worry about that.